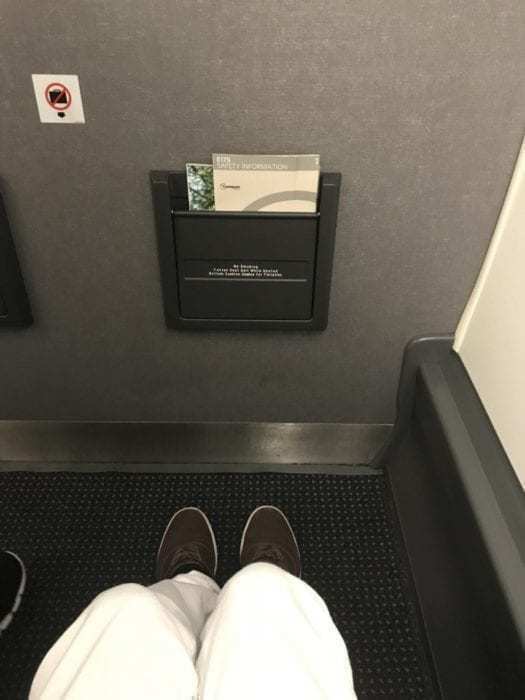 I’ve already written about my travel from San Antonio to Los Angeles in Delta Connection First and from Fiji to Sydney in Virgin Australia Business. This segment came as a result of the roundtrip ticket I purchased from leaving Fiji. Since I needed to leave Fiji in February and return in March and already had my Virgin Australia flight booked, it made sense to buy a roundtrip from Fiji. On the return, however, the flight from Los Angeles to Nadi was full. Thus, I was routed through San Francisco on a 6:30 AM American Eagle flight. Fiji Airways, a Oneworld Connect partner, codeshares with American Airlines. This meant I would be earning a decent sum of AAadvantage miles for this trip. If you were booking this trip on your own, one-way First fares end up being between $190 and $210. Round trip fares are priced at just under double that, around $350. On this route, American competes with Alaska Airlines, United Airlines, Delta Airlines, and Southwest. With this much competition, it isn’t difficult to find one-way economy tickets as low as $70-75. My flight was originally booked on a mainline 737-800, however, five days before departure American changed the aircraft to an E175 operated by Compass Airlines. 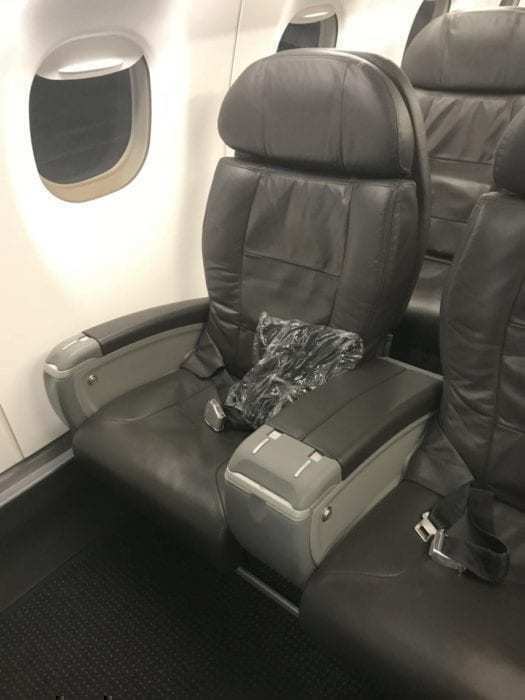 I wasn’t surprised since the seat map showed the original 737-800 to be about only a third full. Since I was traveling with an anxious friend, we decided to get to the airport early for this flight. In fact, we arrived at the airport just over four hours prior to departure. For reference, American’s check-in counters open three hours before their first departure from LAX- which would be our flight. Naturally, we were the first ones in line and once the counters opened, we had checked our bags, received our boarding passes, and passed through security in a matter of 15 minutes. Los Angeles International Airport is surprisingly slim when it comes to lounge availability. On a domestic First Class ticket, American doesn’t give Admirals Club access and in Terminal 4, there are no Priority Pass lounges. Furthermore, since our flight was an American Eagle flight, our gate was in the regional terminal, which we had to be bussed to. Boarding started on time, but we were delayed about 15 minutes due to a mechanical issue. We were greeted by the First Class flight attendant who welcomed us onboard and directed us to our seats in row 1. For this flight, I was in seat 1F. This E175 had 12 first class seats on it. Prior to departure, only four seats (including myself and my friend) were allocated to first class passengers. However, the aircraft ended up departing full due to seating assignments given to Basic Economy passengers, including some upgrades to First. Interestingly, blankets were only present on a few seats. It wasn’t limited to pre-reserved seats since my friend and I had pre-selected our seats, but a blanket was only placed on my seat. The blanket was a pretty standard domestic First blanket. 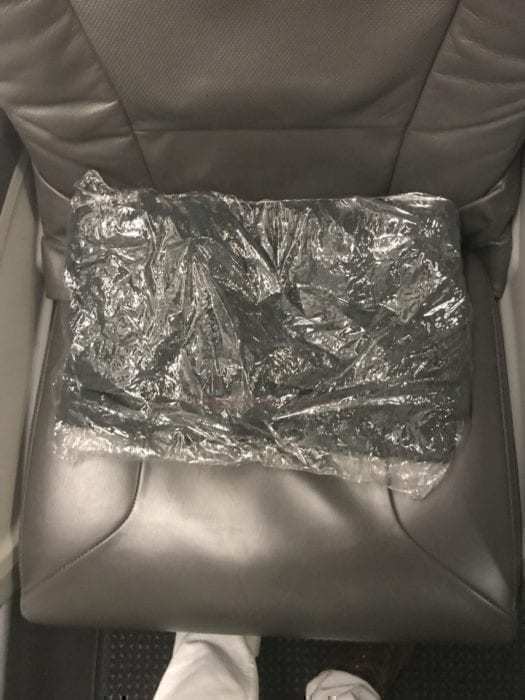 There were no pillows provided and none had been stocked onboard the aircraft. For a 90 minute flight, however, this wasn’t a huge deal. I haven’t flown American Eagle extensively so I’m not sure if this is normal, but I sure hope that isn’t the case. The legroom in row 1 was fantastic. I’m 5’8″ and I had no problem stretching out. This E175 didn’t have power ports available. On a route like this between Los Angeles and San Francisco, I’d imagine there would be quite a few business travelers who would want to charge up their technology during the flight. In addition, for First Class, a power outlet should be provided since most people would be watching entertainment on their own device. On the bright side, it was nice to have a clean cabin. Although this would be expected since I was on the first flight of the day for this particular aircraft. I declined a pre-departure beverage since it was cold and warm beverages would only be served in the sky. There really wasn’t anything else in the way of amenities on this flight. 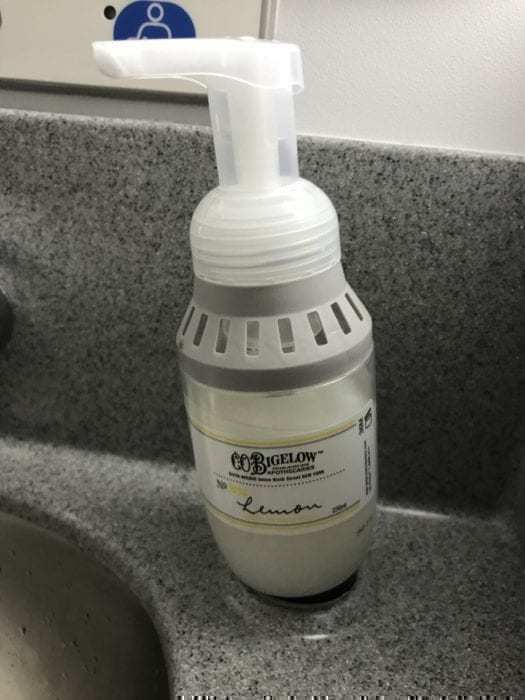 I visited the lavatory which was also clean and stocked with C.O. Bigelow products. I lost track as to when service began after takeoff, but I would guess drink orders were taken about 30 minutes after takeoff. Somewhat surprisingly, the cabin had warmed quite a bit between the boarding door closing and takeoff so I went with a glass of Coca Cola with no ice. After drinks were served, our flight attendant came around to offer snacks from a basket. I went with a biscotti. The early departure meant most passengers were asleep during the service. I counted only three passengers who received a beverage or snack. As a result, the entire First Class service lasted a total of eight minutes. As the flight progressed, more passengers did wake up, but our flight attendant never passed through the cabin to offer additional snacks. She did, however, offer beverages to passengers as they woke. This was the most efficient flight attendant I’ve ever had by far. She was quick and to the point. Her motions were deliberate. At the same time, when I interacted with her, she was friendly and warm. I remember getting off this flight feeling conflicted. On one hand, for a quick regional hop, it was, by all means, a comfortable flight. On the other hand, First Class is definitely a waste of money for this route. 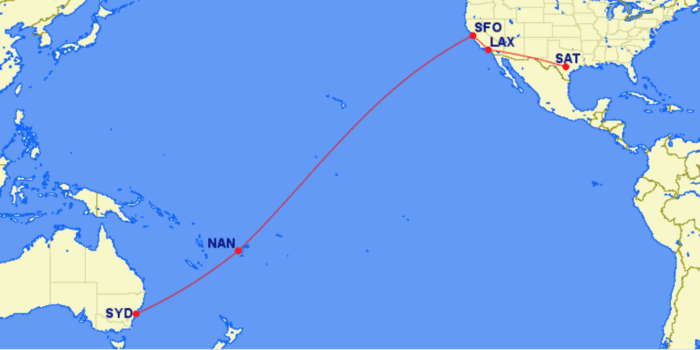 If I ever had to fly this route again, I’d look into using miles for a First Class ticket. 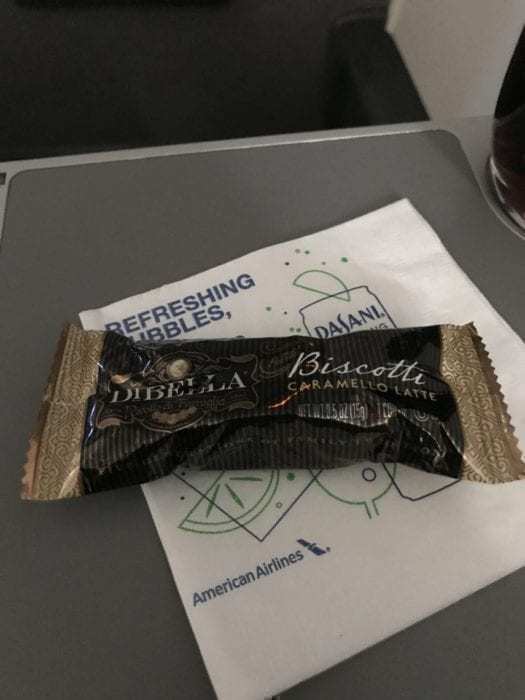 I didn’t expect any sort of First Class meal service on this flight, but I do wish the flight attendant had come through the cabin one or two more times to offer additional snacks. 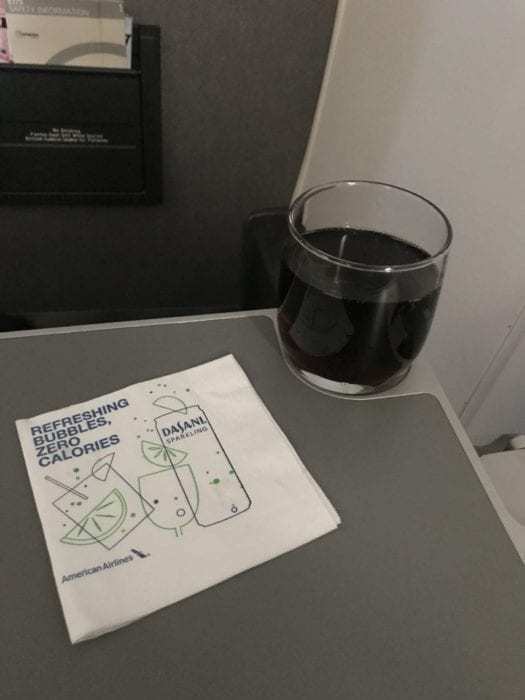 Although the flight was only 90 minutes long, it seemed interesting to me that the flight attendant offered additional drinks but not snacks since the glassware would be collected sooner than wrappers for landing. I would also hope power outlets make their way onboard this aircraft. For First Class, I would expect to have an outlet. On a 90-minute flight, you could easily watch a couple of episodes of a TV show if you’ve pre-downloaded them. Completely unrelated but it gave me a smile to see some of the old Northwest Airlines brandings on their safety card. I flew Northwest Airlines for many years before they merged with Delta. Have you flown this route on American Eagle? What was your experience like? Let us know in the comments!